The Ibanez SA160FM promises a lot with its cool good looks but also delivers great performance too! I have to admit that the Ibanez SA160FM is a good looking guitar I don’t think that there is any doubting that. In essence the guitar could be described as a low to mid-priced super strat with everything that you would expect from such a guitar. But as is often the case with budget guitars have Ibanez had to compromise on quality to deliver the SA160FM at this price. Do you get all that you would expect from an Ibanez or does some of the gloss wear off at this lower price point? I think that you will agree, Ibanez really need no introductions. Their instruments are endorsed by some of the greatest guitarists in the world so you would expect their guitars to be pretty damn good. However, the big question is are they consistent across the board and is there the same attention to detail for the budget end of the Ibanez guitar range. We have had some discussion about this in the past with readers being disgruntled with the lower quality being offered by big name guitar brands, not just Ibanez. Now this could be perceived as damaging for the guitar manufacturer as an initial poor quality guitar could put a new guitarist of using that brand ever again. 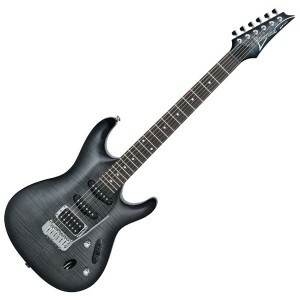 Now the Ibanez SA160 FM is certainly not the cheapest Ibanez guitar, but it is at the cheaper end of the market. So the question we want to answer is whether the Ibanez SA160FM has maintained the Ibanez quality or has it been lost in the desire to produce a cheaper guitar. So what do you get with the Ibanez SA160FM? I have to say that if first impressions are anything to go by Ibanez have certainly not taken their eye of the ball in terms of build quality. Out of the box this is a really nice looking guitar, I had to pause for a minute or two just to admire its fine lines. Lets hope that the rest of the guitar lives up to the good looks! The body of the guitar is made from mahogany with a beautiful flamed maple top. The Ibanez SA160 FM is cut with the Ibanez thin body profile which makes it a comfortable guitar to play. The bolt on neck is made from maple and is finished with a 22 fret rosewood fingerboard. The neck itself is the Ibanez SA neck profile which is slim and fast to play. If you like to skip up and down the fretboard then you will certainly like this neck! In terms of electrics the Ibanez SA160FM comes armed with the typical super strat pick-up configuration of humbucker in the bridge position and two single coils in the middle and neck positions. The pick-ups are Ibanez Quantum pick-ups which are solid enough option for a lower priced guitar. There is a 5 way pick-up selector to access the full array of pick-up options. Add in the master volume and tone dials and you have a fairly standard set-up. The bridge is a Sat Pro II synchronized tremolo which eliminates unnecessary resonance around the saddles by firmly securing them to the bridge plate. This keeps the saddles very stable even during frequent tremolo use. However, this is not a locking bridge so if you get a bit too vigorous with the whammy bar the guitar is liable to de-tune. You have been warned! Plugged in the guitar is pretty good. The sound is bright and punchy and the pick-ups are very responsive. Turn up the volume and the Ibanez SA160 FM starts to show a bit of its rock pedigree, with a nice re-assuring growl from the humbucker in particular. The guitar is very comfortable to play and the neck is fantastic for quick scale runs up and down the fretboard. The Sat Pro tremolo is pretty good with minimal de-tuning encountered. However, if you like your whammy bar and go in for the heavy pitch dives then this is not really a good option for you. To sum up the Ibanez SA160 FM is not too bad. The set-up of the guitar and its styling makes it a very versatile choice whether you play blues, rock or metal. The build quality is good with nothing lost in terms of attention to detail. In essence this is a very good quality instrument which would suit a beginner looking for something more than just a budget guitar or an experienced guitarist looking for a well-priced super strat.